In many parts of the world children cannot go to school, because they are to far away from any school. Louis Soriano came up with a very interesting solution, the Biblioburro. 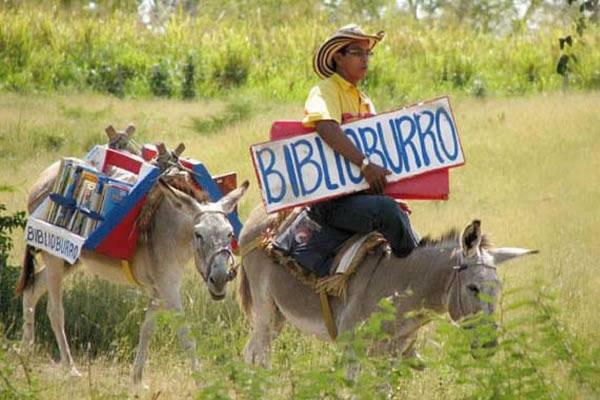 The Biblioburro is a traveling library that distributes books to patrons from the backs of two donkeys, Alfa and Beto. The program was created in La Gloria, Colombia, by Luis Soriano.The biblioburro operates within the central municipalities of the Department of Magdalena, on Colombia’s Caribbean shore. Look at this video and enjoy. I use the picture of the Biblioburro as a background of this site to remind us that most of us are blessed and many other people have severe problems if it comes to education and also that there are many people who come up with amazing solutions.